This is one of those solutions that could never go wrong. It is perfect for a wide range of interiors, even though it is most common for traditional ones. The shades to choose from are numerous – anything from light pine or birch to dark teak and mahogany is available in stores. This is another wise option for traditional and rustic interiors. Reclaimed rustic wood can either have an original, non-tinted shade, or it can be painted. This is a relatively rare decoration option, but it surely has its pluses. First of all, rustic dinner tables and chairs feature a very solid build; next, the shade specter to choose from is practically unlimited. Vintage dining room sets can be either very bulky (and bit gloomy), or incredibly light. The latter ones usually feature intricately carved table and chair legs, and they are normally referred to as French cottage style. On the one hand, going antique is an exquisite solution; on the other one, finding matching items might be a bit challenging. Tempered glass dinner tables and chairs, designed in a similar fashion, look simply amazing. Such sets are designed for modern interiors, and they look especially cheerful in sunlit rooms. MDF is one of the most common furniture production materials – it is affordable and it features practically the same qualities as wood. MDF, covered in high gloss finish, is a very popular decoration solution in modern dining rooms. Usual colours include white, taupe, beige, and black. Whatever dinner tables and chairs you choose in the end, make sure that you stick to high quality solutions. The major drawback of any low quality, cheap furniture is that it is not designed to last. So, if you are looking for something that will stay with you for many years, always choose in favour of higher quality solutions – in the long run, they are more affordable than cheap furniture. 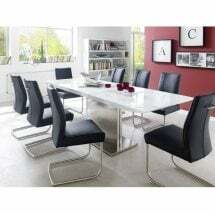 So, finding a reliable store that works with leading manufacturers is of primary importance any time you are looking for dinner tables and chairs. In the UK, one of the platforms that are worth checking out is Furniture in Fashion . This is one of the leading online sites, offering a vast selection of items, quick deliveries all over the country, and prices below average limit.